The BBMP, after a rap from the Karnataka High Court in April, decided to constitute ward committees as per the Karnataka Municipal Corporations Act, 1976. We welcome this decision of the BBMP to constitute ward committees. This will ensure that decentralized governance takes place and that citizens have more say in the development of their wards. A press meet demanding inclusivity in constituting ward committees was organised by several groups and organisations on June 15th, 2017 (Thursday) at the Press Club. 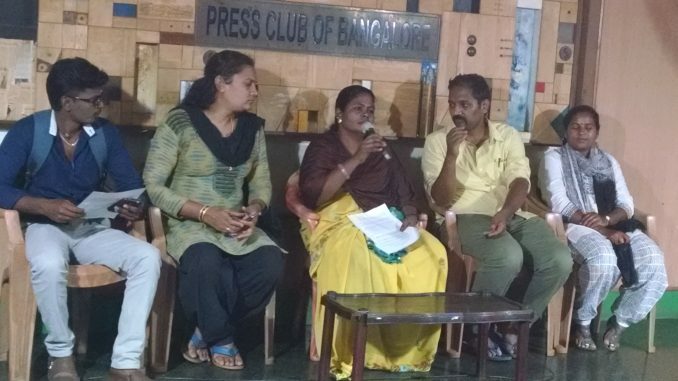 Rajeshwari of Sthree Jagruti Samiti, who work with domestic workers, said that when they approached their corporator to give in their nomination, the corporator told them that the ward committee was set up over a year ago and they were late in submitting their names (this was in May 1st week, when no ward committees were constituted). Another corporator they approached in Jayanagar told them that since domestic workers are not educated, they cannot serve well in the ward committee! Madeena Taj of Garment Mahila Karmikara Munnade said that the corporators only treat workers and the poor in their wards as vote bank. “They don’t want us on ward committees as they look down upon us,” she said. Nisha Gulur of Sangama said that when she went to submit her nomination to the committee, along with her qualifications as a social worker, the corporator said that the ward committee was set up a year ago and that she was late. “Even when we present our work to them and they are familiar with our work, they do not consider us for the ward committee,” she said. Rajesh of Slum Janara Sanghatane said that the corporators are scared to put workers and the poor on the ward committees as they know we will question them and their way of working. We met the Mayor on 2nd May 2017 and directed by her to submit the names to the corporators, which was also done. We then also submitted a consolidated list of these names for more than 30 wards, to the BBMP. However, BBMP has so far finalised names for 127 wards, but none of the people we asked to be nominated have received any intimation. Currently, we have been asked by the BBMP to meet their AROs/AEEs and submit our nominations again. “Citizen groups are running online campaigns to gather names for ward committees and the BBMP is willing to accept those names. We welcome the fact that more people are interested, but we must ensure that the ward committees are representative and truly reflect the diverse population of the city,” said Vinay Sreenivasa of Bengaluru Jilla Beedhi Vyapaari Sanghatengala Okkuta (Federation of Street Vendor Unions of Bangalore). The last time that ward committees were constituted, it was seen that the ward committees consisted mostly of the corporators’ supporters and a few members representing Resident Welfare Associations. The ward committees were not representative. A ward in Bangalore may consist of apartments, slums, street vendors, domestic workers, pourakarmikas, garment workers, software engineers etc. However, only the well-off and well-connected, English speaking representatives got into the ward committees. In fact, this is not a Bangalore specific problem. This happened in Mumbai as well. A research study  shows that as a result of this, the ward committees there mostly discussed the following issues – naming, renaming of roads; road quality; solid waste management; water supply; storm water drains. Questions of welfare, housing, etc., were not on the priority. Another research report looking at ward committees in Kerala and Maharashtra states – It was found that major issues in the wards like problems with water supply or road was found to receive support in deliberations of all members. But, issues related to a particular group like welfare pensions or some infrastructure need of a particular locality were usually raised by only the concerned members . Thus, what we can see is that if questions related to the urban poor are to be raised – about housing, about the reach of welfare schemes (like sewing machines, training to drivers, etc. ), it will happen only if the urban poor are in the committee. Can we realistically expect a RWA in a rich area to raise the question of provision of water and drainage to the slums in the same ward? Recognising this, Kerala and West Bengal have provisions in their Municipal Corporations Acts and Rules to ensure that the poor and workers are included. Section 4(4) of the West Bengal Municipal Ward Committee Rules, 2001 allows for women members of BPL families to be nominated to the ward committees; In Kerala, Section 43 of the Kerala Municipality Act, 1994 allows for members of registered trade unions to be nominated to the ward committee. In spite of asking for this in Karnataka, when the rules were to be framed, this was not done. BBMP has set aside several crores for welfare. If the representatives of intended beneficiaries are in the ward committees, it will be easier to make sure that it reaches them. If Powrakarmikas are in ward committees, their grievances will also be looked into. If slum residents are in ward committees, they can ensure all round development of the slums as well. Today we have lakhs of garment workers and domestic workers. They have several issues pertaining to BBMP – these can be addressed as well. If street vendors are included, they can support BBMP in enforcing the rules and in creation of street vending zones, among other things. 1) That our nominations be accepted and scrutinized immediately. 2) Ensure that the ward committees have wide representation. The rich, middle class, poor all are to be included. 3) Minority communities like Transgenders and Sexual minorities; People with Disability should be included. 4) BBMP conducts trainings on ward committees, their powers and rules in Kannada and other languages all over the city so that people are aware of the same and is accessible. We also demand that the state government should, during the next session, bring in amendments to the KMC rules so that nominations of the poor and working class people is made mandatory.